Greetings, and an early welcome to the Zumbro Endurance Run 2017! We are just over a month away from this years race! We wanted to get an email off to you welcoming you to this years race and give you a couple of updates as we get closer to the big weekend! The 17 mile race sold out in record time this year (note that we do not keep a waiting list) but there are still spots in the 50 and 100. We are still looking for volunteers – we welcome 17 and 50 milers who want to take the day off and come hang with us on Friday volunteering at an aid station (and getting stoked / inspired to run) or if you have friends or family that would like to chip in we would appreciate that too! You can learn more and sign up to volunteer HERE. Even though Zumbro got hit with a snowstorm this past weekend, dropping over a foot of snow, the mid-February melt that we experienced a couple of weeks ago should lead to things drying up at Zumbro pretty well this year since most of the base was gone before last weekends storm. 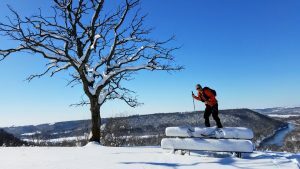 There is however always a chance for a March snowstorm to set things back again, so at this point, hope for the best but expect any and all conditions – it is Zumbro after-all! Last years 2nd place 100 miler Rob Henderson doing a little ski recon with the RD last weekend. We are finalizing the shirt and bib designs and will be launching those soon on our Website and on Facebook, so stay tuned to both. Any critical updates will always be on the website and we use Facebook more for non-critical updates and entertainment. Make sure you are reviewing all info on the race website so you are prepared for the race and there are no surprises. As always we will have lots of cool shirts, sweatshirts, stickers, posters and more available for sale down at Zumbro – with NO cell / internet coverage available at Zumbro we do not accept credit cards so make sure you bring cash or check! High-quality silkscreened die-cut sticker – they cost a little more but they are so worth it, especially this one. We accept cash or check only on race weekend. We did an original piece of artwork for this years race – designed by John Storkamp inspired by the The Zumbro Endurance Run printed on a 7 3/4″” wide, mellow concave, premium American / Canadian Maple skateboard deck! You can hang it on the wall or ride it! Skate deck top color will vary and is picked random. We are taking pre-orders only for these so if you want one you will need to commit in advance and pay / pick up on race weekend. You can order yours ​HERE​. Zumbro skate deck? We are as passionate about our art as we are our running – here is an opportunity to own a unique piece of Zumbro art! 100 milers, what better way to say thank you to your pacers or crew? Bib assignments will be made within a couple of weeks before the race and will be available on the website. We will send you a final email between 10 days and 1 week from the race with some reminders and any last minute info. Again, be sure to read all the info on the website so you are fully prepared for the event. Should you have any questions please shoot me an email. We look forward to seeing you all in just over a month!